Justin Resnick started the tournament in 2007 when he was a junior at Jericho High School and had an interest in helping children on the autism spectrum. 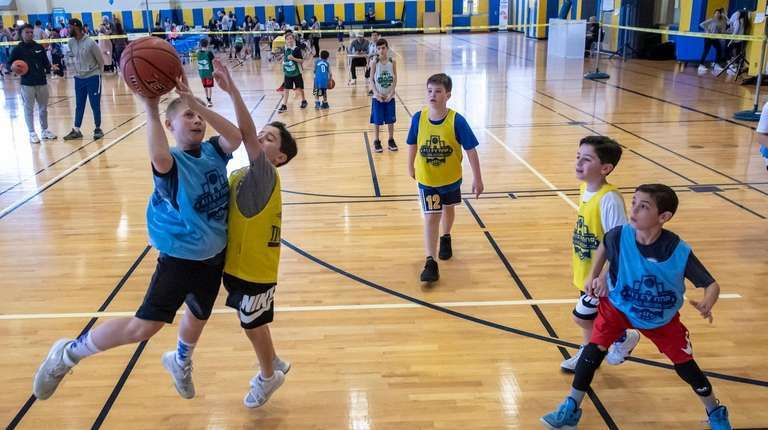 Children play basketball at "Alley Oop for Autism" on Saturday at Jericho High School. Photo Credit: Newsday/J. Conrad Williams Jr.
Basketball players filled the gym at Jericho High School on Saturday to raise thousands of dollars for autism support. 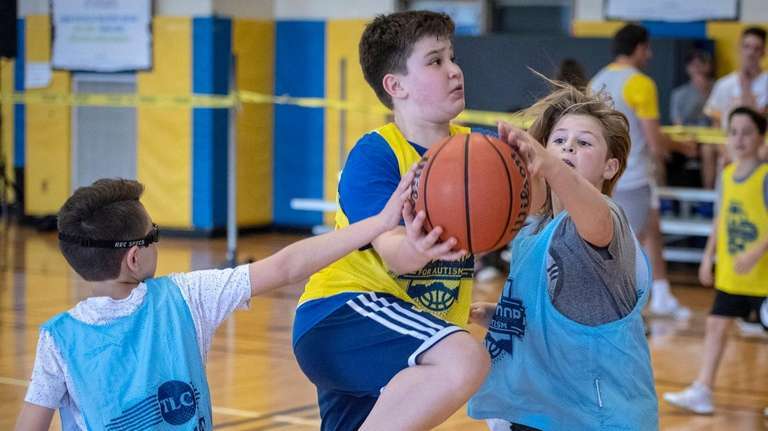 This year, the 13th annual Alley Oop for Autism tournament raised about $100,000 for the Family Center for Autism, a Garden City-based nonprofit that offers classes and activities for people with autism. Hundreds of children and adults played in short, 3-on-3 games, while in a separate gym, special-needs teams faced each other in full-court basketball games. Participants play a game of basketball at the "Alley Oop for Autism" event on Saturday at Jericho High School. The event raises about $100,000 each year. Photo Credit: Newsday/J. Conrad Williams Jr.
“It’s a good idea for a good cause,” said Spencer Smith, 14, who played with his brother Maxwell on a team of eighth-grade boys in the main gym. Former New York Jets safety Erik Coleman and Michelle "Angel" Athenas of Huntington, who has autism, ADHD bipolar disorder and won four gold medals in powerlifting at the 2019 Special Olympics World Games, both stopped by the tournament. “I have autism, that’s why I came here to support all the kids and show them what people with disabilities can do,” Athenas said with her medals draped around her neck. Justin Resnick, 28, started the tournament in 2007 when he was a junior shooting guard at Jericho High School. He always had an interest in helping children on the spectrum, so Resnick started the event and raised about $100,000 for the Ascent School in Deer Park that specialized in educating children with autism. Debbie Levine, whose son attended Ascent, said she was so moved by Resnick and his cause that she has been volunteering ever since. After graduating from Jericho, Resnick went off to play basketball at Emory University in Atlanta, but has returned to his alma mater every year to help plan the tournament. In a gym next door, the Dream League played against the Nassau County PAL Special Needs Unit. The PAL went up early in what was a fast-paced game from the tip, when Keeara McAllister, 15, streaked down the court and sunk a midrange jumper to cut the lead. Her mother, Cynthia McAllister, raised her hands and cheered from the sideline.